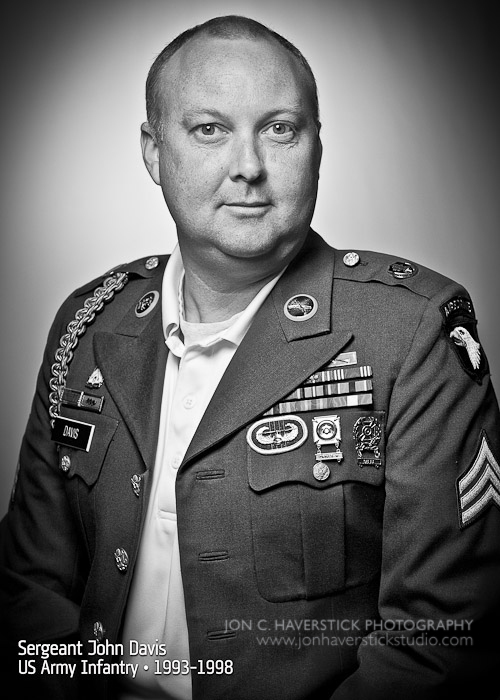 This morning, I had the distinct privilege of photographing US Army veteran, Sgt. John Davis, as part of my “Faces of Freedom” project: a series of simple black and white portraits honoring our nation’s veterans. Just a small token of thanks for their service and sacrifice. John was terrific! Not only did he agree to sit for me, but he did so in front of 35 other people at our weekly BNI (Business Networking International) meeting! Now that takes guts! Thank you, John, for your willingness to help with my presentation this morning. But more importantly, thank you for your service to our country! Please take a moment today to show your appreciation to a veteran. This entry was posted in Military, Portraiture, small flash lighting, Uncategorized and tagged black and white, Faces of Freedom Project, Military, portrait, small flash, veteran. Bookmark the permalink. ← Jennifer and Clayton – The Wedding! Great photo from a great shoot! John was a great sport letting you shoot him during the meeting. I think the resulting image is wonderful. Thanks, Jennifer! Agreed – John was terrific! I thought it was great fun (and with just a little added pressure having to complete the entire shoot in less than 10 minutes!). Jon you did an amazing job, I can’t believe how fast you did this. I am very impressed with the detail on the photo. Lighting, lighting and lighting. Very good! Thanks, Michael. And sometimes the simple lighting is the most effective.